On Saturday, April 13, 2019, the Austin chapter of the Arab-American Anti-Discrimination Committee (ADC) is sponsoring a cultural event for Land Day. The event will include performance by noted vocalist Nisreen Hajaj and a performance and talk by Palestinian activist, writer, comedian, and filmmaker, Amer Zahr. The event takes place from 6:30-10:30 p.m. at The Omni Austin Hotel at Southpark. Childcare will be provided at the event. Proceeds from tickets will benefit children in Gaza through the Palestine Children Relief Fund (PCRF). 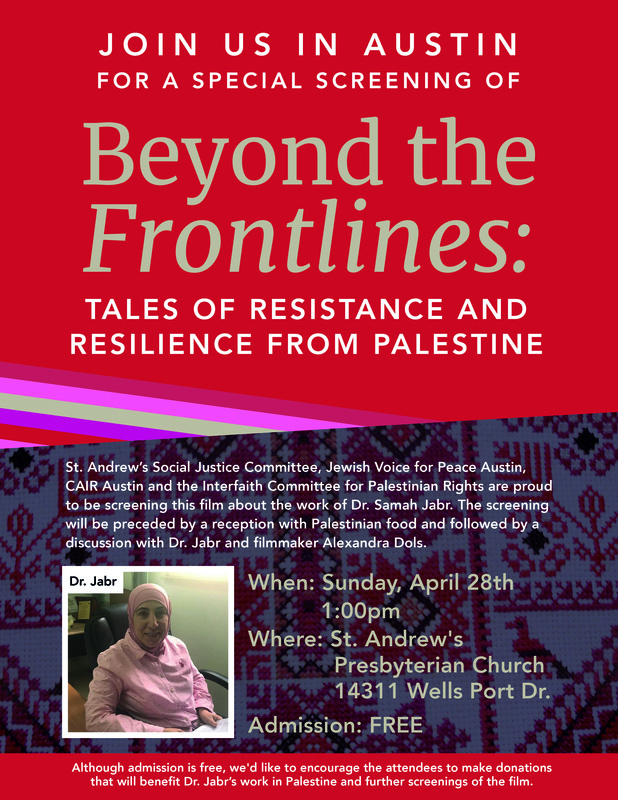 On Sunday, April 28, the Austin chapter of Jewish Voice for Peace is co-sponsoring a screening of the film, Beyond the Frontlines, about the work of Palestinian psychiatrist, Dr. Samah Jabr. Austin is one of four cities in the country where Dr. Jabr and filmmaker Alexandra Dols will be present for discussion. A reception featuring Palestinian food will precede the screening. The reception and screening begin at 1 p.m. at Austin’s St. Andrew’s Presbyterian Church. There is no admission charge, but donations to continue Dr. Jabr’s work will be accepted. The event is a shared project of the USA Palestine Mental Health Network and several local organizations: St. Andrew’s Social Justice Committee, Jewish Voice for Peace Austin, Council for American Islamic Relations Austin, and the Interfaith Community for Palestinian Rights. This entry was posted in Metro and tagged Beyond the Frontlines, Jewish Voice for Peace, Palestine. Bookmark the permalink.